These people are awful and I would do the same. I am afraid of dogs and would totally (resentfully) cross on the other side of the street to avoid being lunged/barked at even with a fence between us. They are TERRIBLE. Terrible. I would be anxious and fuming each and every time I passed that house. And the sidewalk parking? I have NEVER seen such a thing. Terrible! I am on the verge of actual tears of frustration over it. I feel them welling up, and my throat is getting tight. I am completely on your side. Well, I am a dog owner but I have VERY LITTLE PATIENCE for a whole host of other dog owners, including these people. I know it's private property and all, but it just doesn't seem right to me what a big, scary dog should be out in the front yard where people have to walk right against the fence. Re. the people with the bushes across the street: does your city not have a clear sidewalk bylaw? Here, if you complain, the city will give the owner one month to trim their bushes back to the property line, or else the city does it and sends them an invoice. Chuckling at a little girl falling down? The rest was bad enough but that is beyond terrible. So yes, I agree, they are terrible, their dog is terrible, and the bushes across the street should be clipped. That's AWFUL. I'd probably cross the street to avoid the dog, and I'm a dog person. My uncle's German shepherd could easily leap over a chain link fence when he felt like it (usually to chase a squirrel or rabbit), so I'm a little paranoid about aggressive dogs and short fences. Sorry you have to deal with that. I remember having to walk past a rather territorial dog when I was growing up, and as I got older, it used to really irritate me: "Look, dog, I *LIVE* here." It bugs me when owners don't make a little more effort to teach a dog Friend from Foe -- and that just being on the sidewalk doesn't make you Foe. There was a big German Shepherd around the block from us for years, and the owners would let that dog bark and bark and bark at people walking in the street. Across the street. Now, I love a good German Shepherd. I think they're a fabulous specimen of dog, and I've met some amazing specimens of the specimen. But this dog...one day, I was out running, and I came past his house on my cool-down walk, and he was one the lawn, barking at me. On the lawn, OK. Most days, he stayed there. This day, he walked off the lawn away from the house into the street, and challenged me. Seriously? I'm IN THE STREET. I'm nowhere near your house. And even if I were, hello? People come to houses sometimes. Is this how the dog behaves when the paperboy comes? Or the neighbor kid? I actually had to turn around and go home a different way, because this dog wouldn't budge. So, yep. Color me outraged with you. And after he chuckled at a stumbling child? Oh no he didn't. It seems like it should be illegal! I mean, an assault is just telling someone what you are going to do to them, so why is it okay for a dog to heavily insinuate what is going to happen to you? I'm so sorry, ugh. Ooooh this sounds TERRIBLE. I am scared of dogs, especially in that situation where it FEELS like I'm about to get eaten, but am telling myself that really not, I need to calm down, be rational, it's fine. Because DON'T TELL ME TO CALM DOWN IT WANTS TO EAT ME. 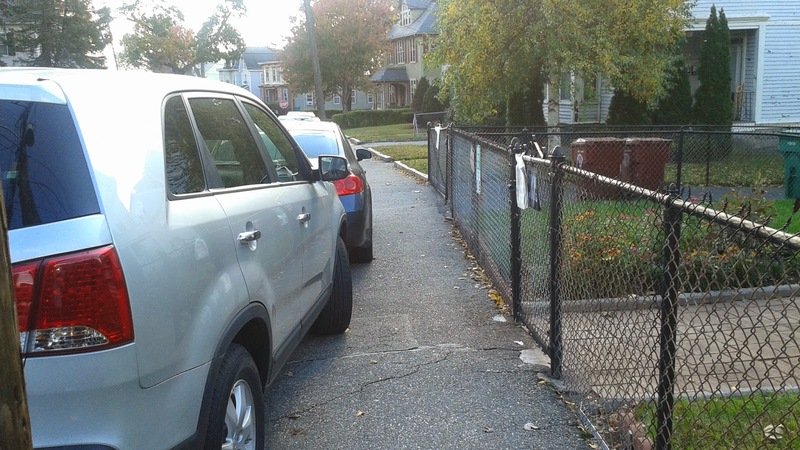 Re: sidewalk parking, the only place I have really encountered this egregious behavior in our new locale is at Mass. MY ENTIRE PARISH PARKS ON THE SIDEWALK. I am trying to see this as God making a funny joke so that I can think of you every Sunday, but I would also like to buy an ad in the bulletin about proper sidewalk use. @Susie: WE LIVE IN A SOCIETYYYYYYY! Please print ALL of this out and bring it to the police dept. I am in tears. I need to go back and look at that scarecrow again to find something to smile about.